Artist's concept painted by Oliver Wendell Schenk, 1972. 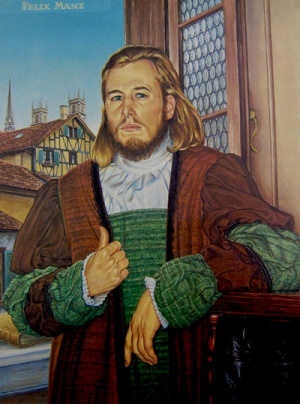 Felix Manz, one of the founders and first martyr of the original Swiss Brethren congregation in Zürich, Switzerland, was born about 1498, the son of a Zürich canon, acquired a thorough knowledge of Latin, Greek, and Hebrew. When Zwingli came to Zürich in 1519, Manz joined him enthusiastically and became a regular attendant at Zwingli's Bible classes. Differences of opinion soon arose when he and his associates demanded the abolition of tithes and interest. Zwingli hesitated, although he could not entirely close his mind to the Biblical basis for this demand (see his noted sermon on divine and human righteousness on 24 June 1523). Even more insistently the Brethren demanded the abolition of the Mass. When Zwingli left the decision in this matter in the hands of the Zürich city council the Brethren broke with him and henceforth held their own meetings in the home of Felix Manz's mother. The question of baptism at once arose. Several fathers refused to have their children baptized. They were fined. On 17 January 1525 a public disputation was held in the city hall of Zürich to decide the issue, with Conrad Grebel and Felix Manz representing the Brethren. Zwingli was pronounced the victor. In consequence an order was issued on 18 January threatening those who would not have their children baptized within eight days with banishment from the city. Grebel and Manz were to desist from their arguing and submit to the opinion of "my lords (of the city council)." This the Brethren refused to do. On 21 January they performed the rite of adult baptism and held a communion service among themselves, thereby making their break with the Zwingli church final and establishing their brotherhood as a distinct Christian body. The movement spread rapidly through the city and the canton of Zürich. Felix Manz was among the most zealous in proclaiming the new doctrine. He was repeatedly arrested. He earnestly requested an opportunity to express himself in writing on the points in dispute, since it was impossible to do justice to the matter in oral debate. But the council refused. The second disputation in Zürich took place on 20 March 1525. The result was again negative. The Brethren (14 men and seven women) were imprisoned in the Hexenturm on bread and water. On 5 April they managed to escape. But they were soon captured and subjected to a severe cross-examination. Felix Manz testified that he had never rejected government, interest, and tithes. If he had taken the liberty to preach in other pastorates, he had only done what a disciple of Christ must do. Capital punishment he had denounced, as well as the use of the sword; community of goods he had not taught, but only willingness to share with the needy. Two weeks after his escape from the Hexenturm he had baptized in Embrach, and would continue to do so. For a long time we have had among us one who calls himself Felix Manz. The same has created much trouble and discord among our people by baptizing old people and corner preaching, to such an extent that we ordered him to leave the city. After this he returned and did as before, disregarding the public proclamation in the church forbidding adult baptism on penalty of death, loss of honor and loss of property. Therefore we arrested him and held him a few days. But because he is an obstinate and recalcitrant person we released him from prison and because he is one of yours we have sent him to you, with the friendly request that you look after him and keep him in your territory, so that we may be rid of him and our people remain quiet, and that in case of his return, we are not compelled to take severe measures against him. In Zürich Manz was confined in the Wellenberg for several months and then released on 7 October. On the next day he was already with Grebel taking part in a meeting of the Anabaptists at Bezholz. Here they were surprised by the magistrate. Grebel was seized, but Manz escaped until 30 October, when he was also put in prison. At the suggestion of the magistrate the third public Anabaptist disputation was held in Zürich on 6 and 8 November in the Grossmünster of the city. Grebel and Manz were again the spokesmen of the Brethren. The outcome was that on 18 November the council sentenced Blaurock, Grebel, and Manz to prison on bread, water, and "Mus," forbidding all contact with the outside, "as long as my lords should see fit." This imprisonment was not of long duration. Soon afterward we find the three leaders of the Brethren again in the highlands of Zürich, where they promulgated their doctrines more vigorously than ever. They were again arrested and subjected to a severe questioning. They held to their faith and were ready to die for it. Again they requested permission to present their case in the matter of baptism in writing, as Zwingli had already done in his book, Vom Tauff, vom Wiedertauff und vom Kindertauff (at the end of May 1525). Manz expressly stated that he had never disputed, but had only testified to his faith; the Scriptures alone had led him to his position on baptism; no Christian could strike with the sword, nor does he resist evil. The council now resorted to severer measures. On 7 March the sentence was pronounced: "Manz, Grebel, and Blaurock, besides 15 other Anabaptists including six women, shall be placed on straw in the new tower on bread and water until they die and decay. No one may visit them or have power to change their condition, be they well or sick, without the consent of my lords." Repetition of the offense would be punished without mercy by drowning. Sooner than the severity of the verdict would indicate, the prison doors were opened. At any rate, by April 1526 the three Brethren leaders were assisting their harried brethren in Grisons and Appenzell. In the fall of 1526 it was learned that Manz and Blaurock were in the region of Grüningen baptizing. To put an end to this activity the council applied the edict of 7 March, which made adult baptism punishable by drowning. On 3 December 1526, Manz and Blaurock were surprised at a meeting of the Brethren, seized, and taken to Zürich, where they were placed in the Wellenberg prison. It was Manz's final imprisonment. On 5 January 1527 he was sentenced to death, "because contrary to Christian order and custom he had become involved in Anabaptism, had accepted it, taught others, and become a leader and beginner of these things because he confessed having said that he wanted to gather those who wanted to accept Christ and follow Him, and unite himself with them through baptism, and let the rest live according to their faith, so that he and his followers separated themselves from the Christian Church and were about to raise up and prepare a sect of their own under the guise of a Christian meeting and church; because he had condemned capital punishment, and in order to increase his following had boasted of certain revelations from the Pauline Epistles. But since such doctrine is harmful to the unified usage of all Christendom, and leads to offense, insurrection, and sedition against the government, to the shattering of the common peace, brotherly love, and civil cooperation and to all evil, Manz shall be delivered to the executioner, who shall tie his hands, put him into a boat, take him to the lower hut, there strip his bound hands down over his knees, place a stick between his knees and arms, and thus push him into the water and let him perish in the water; thereby he shall have atoned to the law and justice. . . . His property shall also be confiscated by my lords." He was taken bound from the Wellenberg over the fish market to the boat. As he was being taken between the shops he praised God with a loud voice and cheerfully testified to the people that he was about to die for the truth. Meanwhile the dismal procession had reached the place of execution. It was three o'clock in the afternoon. "As he stood there with the depths of Lake Zürich below him, the blue sky over him, and the mountains with their snowy peaks in the sunshine, around him, his soul in the face of death looked out above these. As a preacher at his side spoke sympathetically to him encouraging him to be converted, he hardly heard him; but when he perceived his mother's voice on the opposite bank, together with his brothers admonishing him to be steadfast, he sang with a loud voice while he was being bound, In manus tuas, Domine, commendo spiritum meum,' and the waves closed in over his head." He was buried in the St. Jakobs cemetery in Zürich. The Ausbund, No. 6, has a song written by him: "Mit Lust so will ich singen." While he left no published writings, the Protestation und Schutzschrift of December 1524 addressed to the Zürich Council, attributed to Conrad Grebel by Egli, Köhler, and Bender, has been shown by W. Schmid to have been written by Manz. Bender, Harold S. Conrad Grebel, c. 1498-1526: the founder of the Swiss Brethren sometimes called Anabaptists. Scottsdale, PA: Herald Press, 1950. Braght, Thieleman J. van. Het Bloedigh Tooneel of Martelaers Spiegel der Doopsgesinde of Weereloose Christenen, Die om 't getuygenis van Jesus haren Salighmaker geleden hebben ende gedood zijn van Christi tijd of tot desen tijd toe. Den Tweeden Druk. Amsterdam: Hieronymus Sweerts, 1685: Part II, 3. Braght, Thieleman J. van. The Bloody Theatre or Martyrs' Mirror of the Defenseless Christians Who Baptized Only upon Confession of Faith and Who Suffered and Died for the Testimony of Jesus Their Saviour . . . to the Year A.D. 1660. Scottdale, PA: Herald Press, 1951: 415. Available online at: http://www.homecomers.org/mirror/index.htm. Brons, A. Ursprung, Entwickelung und Schicksale der Taufgesinnten oder Mennoniten. 3. Auf. Amsterdam : Johannes Müller, 1912. Füssli, Johann Conrad. Beyträge zur Erläuterung der Kirchen- Reformations-Geschichten des Schweitzerlandes : enthaltende authentische bishero zum Theil ungedruckte, zum Theil gantz rare Urkunden, ... Schutz- und Streit-Schriften, darinnen die Zwistigkeiten der Römisch-Catholischen, der Lutheraner, und der Reformirten, wie auch der Wiedertäuffer ... : nebst historisch-critischen Anmerckungen zur Beschüzung des seeligen Reformationswerckes. Zurich: Bey Conrad Orell und Comp. ; und Leipzig: Bey Joh. Fried. Gleditsch, 1741-1753. 5 vol. Hege, Christian and Christian Neff. Mennonitisches Lexikon, 4 vols. Frankfurt & Weierhof: Hege; Karlsruhe: Schneider, 1913-1967: v. III, 22-24. Mennonitische Blätter (1888): 9; (1894): 4. Wolkan, Rudolf. Die Lieder der Wiedertäufer. Berlin, 1903. Reprinted Nieuwkoop: B. De Graaf, 1965: 8 f., 141. Neff, Christian and Harold S. Bender. "Manz, Felix (ca. 1498-1527)." Global Anabaptist Mennonite Encyclopedia Online. 1957. Web. 24 Apr 2019. http://gameo.org/index.php?title=Manz,_Felix_(ca._1498-1527)&oldid=145842. Neff, Christian and Harold S. Bender. (1957). Manz, Felix (ca. 1498-1527). Global Anabaptist Mennonite Encyclopedia Online. Retrieved 24 April 2019, from http://gameo.org/index.php?title=Manz,_Felix_(ca._1498-1527)&oldid=145842. Adapted by permission of Herald Press, Harrisonburg, Virginia, from Mennonite Encyclopedia, Vol. 3, pp. 472-474. All rights reserved.